These booking terms ('Booking Terms') are between the person or legal entity making the Booking ('You/Your') and the accommodation provider stipulated in Your confirmation email ('Booking Confirmation') ('We, Us, Our'). These Booking Terms are governed by English law and apply to all Bookings placed with Us. By making a Booking You are deemed to accept and be bound by these Booking Terms. Bookings are made and a contract between You and Us comes into effect when We accept a reservation from You. A reservation is deemed accepted when We have confirmed Your reservation and received either: (i) full payment of the total price; or (ii) payment of any other amount We have specified at the time of Your Booking. The latest arrival (check-in) and departure (check-out) times are usually arrive 3-6pm, depart by 10.30am. Should You wish to check-in later than the specified latest check-in time You must confirm this to Us directly. In the event that You attempt to check-in later than the stated times without prior arrangement, or fail to check-in at all, the Cancellation Policy section below may apply.. The total amount payable to confirm Your Booking is quoted in Your Booking Confirmation Invoice. Charges for using PayPal are transferred to the client. At the end of Your stay, any remaining outstanding balance and any additional goods and services purchased during Your stay must be paid in full. We operate an Honesty Shop and request that you keep a list of the 'extras' that you have as you go along for a speedy and efficient departure. The Loss/ Damage Security deposit will be returned to you in full where no claims have been made. Whilst we endeavour to check all units before you leave , sometimes you may leave some property behind. If so, we will hold this for 1 week. If you do not contact us for the item/s concerned we will discard the item ourselves by the end of that week. Although We take care in how we present our accommodation, We do not make any particular representation as to the suitability of Our accommodation to your specific requirements. Should You have any specific concerns or should You like to check the specific conditions of stay, please contact us directly BEFORE the cancellation deadline, and We will do our best to address these. We will not be liable to You where We have exercised reasonable care and skill in our provision of the selected accommodation services to You. We will not be liable for failure to perform to the extent that the failure is caused by any factors beyond Our reasonable control, including the provision of said accommodation services. You are responsible for any damage or loss caused by You during Your stay with Us, including any damage to Our property by Your act, omission, default or neglect and You agree to indemnify Us and You agree to pay Us on demand the amount reasonably required to make good or remedy any such damage or loss. Further, we reserve the right to terminate Your Booking immediately without being liable for any refund or compensation where You engage in unacceptable behaviour that causes a disturbance or nuisance to Our staff or to other guests on Our premises. We take the protection of personal data very seriously. We may process the information You provide to Us for the sole purposes of completing our duties under this Agreement. The sharing of data is necessary in order to process payments and operate an online service. These third parties operate in conformance with UK data protection regulations. If you have any concerns you should address them to these third parties directly. By making a Booking, You consent to this processing of information as described above and the transfer of Your information to the Establishment and to the booking channel(s) through which Your booking originated. In order to update you with additional events or for our own advdertising we do add your email address to our mailing list. If You cancel Your Booking on or before the cancellation deadline specified in the Cancellation Policy a full refund will be given including any booking extras paid at the time of Your Booking. If You cancel Your Booking after the Cancellation Deadline You will be charged the full value of the late cancellation fee, as detailed below, including any booking extras You have selected for the duration of Your stay. If You do not arrive on the anticipated date of check-in stipulated on Your Confirmation, We are in Our right to consider that You have cancelled the entire Booking and We shall not be under any obligation to hold the accommodation for You on any other date. If You change the number of guests, dates, room nights or room type ('Amendment'), then the prices are subject to change. Should You request an Amendment and should We not be in a position to accommodate Your Amendment, Your Booking may be cancelled. In the event that such cancellation occurs on or before the Cancellation Deadline, the Cancellation fees shall apply. Accommodation is charged per unit cost and not per person cost. If an individual cancels it does not reduce the cost of the accommodation and the loss must be covered between the remaining people in the booking. Booking fee: this is non-refundable. Cancellation charges for All Bookings. 20% if cancelled within 4 weeks of arrival. Cancellations are not accepted on the basis of poor weather. 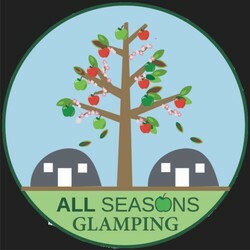 However, if our All Seasons Glamping site becomes waterlogged for any reason and becomes unsafe or unsuitable for use and we have to cancel we will do so only in emergency cases. Notice of this can only be given subject to the concerns at the time. Every effort will be made to ensure that your safety is not compromised and in the event of us having to cancel a booking we will refund all monies to you in full. In the unlikely event that the swimming pool is out of action we will alert you of the situation as soon as possible and offer you compensation of 20% of your total booking for bookings between May – September, accordingly. The swimming pool will not be open from October – April unless specified. If there are power cuts or loss of pressure or cuts in the water supply these remain outside of our control and we cannot be held responsible. In any of these events we ask for your patience. We will keep you informed if this situation arises and/or as soon as we know about it and work with you to ensure that you have minimal disruption.